Are you ready for SST implementation? The MySST Portal is now accessible at https://mysst.customs.gov.my. 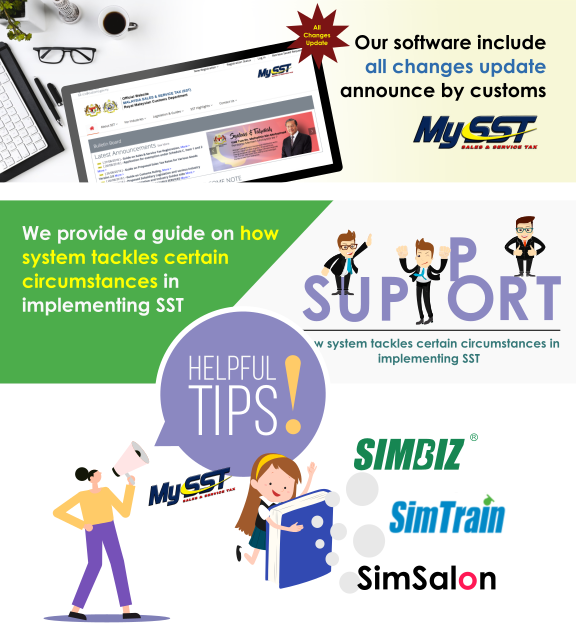 Businesses that received automatic registration for SST may login to through MYSST Portal with the username and password given by the Royal Malaysian Customs Department (RMCD). Also, businesses that were automatically registered but do not fall within the current scope of taxable supplies of goods services may seek to de-register themselves from the system. Royal Malaysian Customs Department has made on announcement on 16 August 2018 in relation to Sales Tax exemption application for the following and the templates can be downloaded at https://mysst.customs.gov.my/ExemptionApplication. Please keep you updated on the further guidelines and announcements, latest news for SST that issued by the RMCD. For further enquiries, please contact Customs Call Center. We understand your worry on the tax changes, we had prepare an user guide for you. to learn more on the changes applied to your system. Prepared by SIM IT SDN. BHD. Address: 20, Jalan Ekoperniagaan 2/5, Taman Ekoperniagaan, 81100 Johor Bahru, Johor.